Under Stephen Peterson’s leadership Simply Energy increased its revenue by 80 per cent in the year to March - a period of significant expansion for the business. Simply Energy, co-founded by Peterson in 2006, doubled its staff to 26 in the past year. It acquired a significant stake in YouDo Energy Services last year and has since rolled out a number of new products. Its TENCO EBS business also became the country’s largest operator of commercial property embedded networks in 2014. Peterson has been a member of the industry’s Wholesale Advisory Group since 2012 and chair of the Independent Electricity Generators’ Association since 2011. 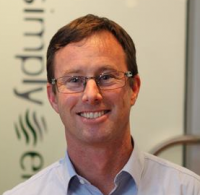 He designed Simply Energy’s original billing and customer relationship management systems to provide a flexible and cost-effective option for small retailers. Last year the company launched its White Label Electricity Retail Service building on the software, licences and infrastructure he designed. The service, now used by two new-entrant retailers, enables retailers to supply electricity to consumers while outsourcing their back office billing, settlement and compliance services to Simply Energy. Four other retailers are trialling this service. Late last year the company’s proprietary solution was launched as a stand-alone product – SPC. The cloud-based, retail application sits inside SalesForce.com. The SPC platform provides clients with their own on-line customer management system and tools to manage retailing functions, including invoicing and customer support. SPC increases the speed to market for electricity retailers and lowers their costs by sharing infrastructure across multiple parties. Simply Energy’s purchase of a stake in YouDo Energy Services last year enabled the partners to accelerate the commercialisation of the Axos Billing product now being used by some new retailers. Peterson was then actively involved in the development of the YouDo’s next product, Axos DataHub. Simply Energy says the product provides a complete service for managing the capture, validation and publication of large volumes of meter data through a single automated system. As well as lowering labour costs and error rates, Axos DataHub will enable Simply Energy to move to a daily billing cycle, reducing the time between meter reads and reducing its working capital requirements by more than 30 per cent. It also has global potential and will be sold under licence by YouDo. Simply Energy says the product is typical of Peterson’s approach - solving a high-value business problem in a way that can then be commercialised so that the cost of developing the infrastructure is spread across multiple parties. The company says it is that approach, coupled with Peterson’s deep understanding of the electricity market, his technical innovation, entrepreneurship and determination to deliver value for customers, that has been integral to Simply Energy’s success during the past nine years.